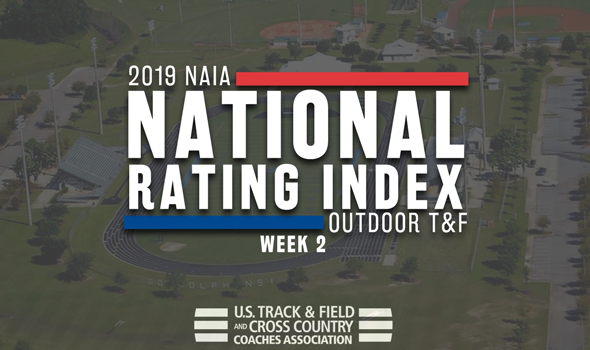 NEW ORLEANS – Big changes dotted the most recent installment of the NAIA Outdoor Track & Field National Rating Index that was released on Wednesday by the U.S. Track & Field and Cross Country Coaches Association (USTFCCCA). Eight of the top-10 men’s teams and nine of the top-10 women’s teams shifted spots between Week 1 and Week 2. Remember: The 2019 NAIA Outdoor Track & Field Championships will be held May 23-25 in Gulf Shores, Alabama. Indiana Tech remained on top of the chart, but Wayland Baptist (Texas) and British Columbia gained some ground. The Pioneers and the Thunderbirds moved up to second and third, respectively in the Men’s National Rating Index. WBU saw a boost in its ranking from Week 1 thanks to the efforts of its athletes this past weekend, namely Donte Irving and Quintaveon Poole. Irving moved up to third nationally in the triple jump at 14.73m (48-4), while Poole, who was already the top-ranked athlete in the 400, is now ranked third nationally in the 200. UBC already had three top-ranked athletes and added two more top-6 marks this past weekend. Rowan Hamilton and Sebastian Yep both had strong performances in the hammer as the former is now ranked third nationally at 60.98m (200-0) and the latter is ranked sixth. William Carey (Miss.) and Saint Mary (Kan.) both dropped two spots to cede space for the Pioneers and the Thunderbirds in the top-5. The rest of the top-10 includes Westmont (Calif.), Southern Oregon, Lindsey Wilson (Ky.), Grand View (Iowa) and Tennessee Wesleyan, in that order. British Columbia still holds an astronomical advantage in the Women’s National Rating Index, but there were some changes behind the leaders. Concordia (Neb.) moved up to No. 2, its best ranking of the season. It was a huge weekend for the Bulldogs in field events, as they now have eight efforts ranked in the top-6 nationally. Four of those are in the top-3 with Adrianna Shaw highly ranked in the discus (second) and hammer (first), McKenzie Gravo listed second in the pole vault and Samantha Liermann billed third in the shot put. Southern-New Orleans (La.) jumped three spots from No. 7 to No. 4 right behind No. 3 Wayland Baptist (Texas). The Knights received strong efforts this past weekend from Kimona Kmikle (the new national leader in the 400H), Kimone Hinds (now ranked second in the 100) and Monique Spencer (now ranked fifth in the 100). Indiana Tech rounds out the top-5 this week after dropping two spots from Week 1. The rest of the top-10 includes MidAmerica Nazarene (Kan.), Westmont (Calif.), Doane (Neb. ), William Carey (Miss.) and Oregon Tech, in that order. It was a huge jump for the Tigers as they climbed 54 spots between Week 1 and Week 2.